This is a great warming and healing meal. The lime leaves and lemon balm are tonics for the digestive system. I make this recipe when there’s any sign of a cold/flu or when I simply need a soothing meal. Use a deep pan and make the stock. Place the water in the pan and add in the stock ingredients. Simmer for 10 mins. You can use a muslin or sieve to hold the dried herbs so that they can be removed after simmering or just strain the liquid and remove solids. Cook the noodles in boiling water. Check timing so that they coincide with the vegetable cooking. Add the base ingredients and vegetables into the stock and simmer for about 5 mins. Just before serving add the fresh coriander. 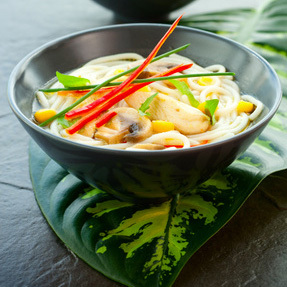 Serve the noodles first into a deep noodle bowl. Then add the vegetables and liquid on top of the noodles. If using chicken then add the chicken and base ingredients to the stock and simmer for 15mins or until cooked. Then add in the vegetables and simmer for a further 5mins. If using prawns cook as above adding the (cooked) prawns 2 mins before serving.